Most people dread gutter cleaning. It’s a messy and dangerous chore, but vital if you want to protect your home from water damage. Below are some tips that should help you clean your gutters safely and efficiently. Check out these six tips before you call someone or get up on a ladder yourself. To avoid the hazards of gutter cleaning completely, consider the many benefits of the Gutter Helmet® gutter protection system. Start with a good ladder. A freestanding ladder is fine if the ground around your home is level. If it isn’t, you’re better off using an extension ladder. Cover your hands. Never clean your gutters without a sturdy pair of work gloves. Use a scoop. Gutter scoops (available at home improvement stores) are the best tool for the job, although a garden trowel is a good substitute. Rethink your collection strategy. Instead of tossing debris onto the ground (creating another clean-up chore), carry a garbage bag to collect it. If you find a garbage bag too tricky to handle, hang a bucket from the underside of your ladder. Remember that safety comes first. Unclog downspouts. Flush out your downspouts to make sure no clogs are left. If there’s a stubborn blockage that won’t respond to water pressure, you may have to remove the downspout and use a long pole to dislodge it. Consider gutter guards. Forget the hassle and worries of gutter cleaning with gutter guard installation. Gutter guards keep debris out of your gutters while allowing water to flow unobstructed for true maintenance-free gutter protection. There are several options to choose from when deciding how to get your gutters clean. Here are a few to consider. Hiring professional gutter cleaners is the simplest but most expensive solution. Ask friends and neighbors for recommendations. Make sure you check the contractor’s standing with the Better Business Bureau before hiring. A leaf blower, shop vac or power washer can make gutter cleaning faster and easier, but they do have their downsides: power tools aren’t always as effective as manual cleaning, and you can’t see the results from the ground. There are plenty of specialty manual gutter cleaning tools on the market, including gutter scoops and claws. But unless you’re using a telescoping tool, you will need to climb a ladder. Cleaning manually is also more time- and labor-intensive. Save yourself the hassle and expense of gutter cleaning by keeping the mess out of your gutters in the first place. While there will be a one-time installation cost, you’ll never have to worry about cleaning gutters with gutter guards again. If you’re responsible for maintaining a multi-story home, apartment building or commercial property, it may be best to install gutter covers or hire a professional gutter cleaner. If you have to do it yourself, make sure you use the right tools for the job. Many home improvement retailers and hardware stores offer ladder rentals. If possible, rent or purchase a ladder stabilizer. Rolling ladders, scissor lifts, scaffolding and cherry pickers are other good alternatives. Be sure to stay clear of power lines, tree branches and other hazards while cleaning, and never clean your gutters on a windy day. 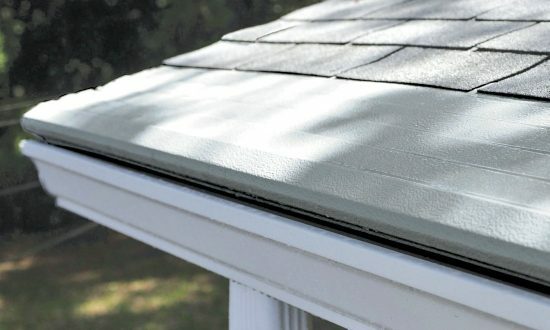 Talk to your local Gutter Helmet® dealer if you have questions about how to clean gutters with gutter guards or want to learn more about our best-selling gutter protection system. You can also call (800) 824-3772 or use the form to schedule a free in-home appointment with one of our sales representatives.